The 2016 MotoGP Championship commences next weekend at the Losail Circuit in Qatar. We have talked about the changes that all teams have to deal with this year in an earlier article, most notably new tires (from Michelin) and a spec ECU and software package (provided by Magneti Marelli). During testing, some of the younger riders have been quite quick, showing potential to ride at the front this year. First, some background. Affectionately known as the “Aliens”, four riders have typically dominated MotoGP for roughly a decade. Until his retirement after the 2012 season, Casey Stoner was one of those four riders, along with Valentino Rossi, Jorge Lorenzo and Dani Pedrosa. Stoner was promptly replaced by Marc Marquez when he joined the series in 2013. Nevertheless, the Club has remained very exclusive … only four members. The new tires and electronics this year might boost another rider into the Club. Maverick Viñales is an extraordinary talent that has been recognized for some time, but this year his factory Suzuki gets badly needed horsepower and a seamless gearbox. During Winter testing, Viñales has been very quick … more that once the quickest rider on the track. More surprising, Scott Redding has really come alive aboard his new Ducati (a GP15), also recording quick times during testing, particularly at the recently completed Qatar test. Ducati has had an easier time than most adapting to the spec ECU and software – in large part due to its existing relationship with Magneti Marelli. Redding has even been faster on his satelite Pramac Ducati, at times, than the factory riders Andrea Iannone and Andrea Dovizioso. This weekend’s race promises to be one of the most interesting MotoGP contests in recent memory. The Repsol Honda riders are still somewhat perplexed by the new electronics. Yamaha (particularly defending champ Jorge Lorenzo) is generally adapting better to the changes. Keep an eye on the all-new Aprilia prototype, as well, as its two riders shake it down in an effort to become competitive. Aprilia and Suzuki are the only teams receiving “concessions” this year, including an allowance of unlimited testing and engine development (engine development is frozen for the other teams), together with an allocation of nine engines per rider (the other teams are limited to seven). the season is about to start but i’m afraid the paddock is not ready. and the reason the paddock is not ready is because Michelin is not ready. in the interest of safety and exorbitant costs to the team (read damaged human bodies/damaged equipment) they need at least a 1/2 dozen more test sessions. even at this late date, Michelin’s having trouble just providing tyres that are ROUND, WTF..? no way that should be happening. this is going to be a real “sh!t show”. VLJ… I couldn’t agree more. So what do you suggest, then? Follow the NASCAR model? All the machines identical except for the paint? Or maybe we should require all the manufacturers to supply at least 8 full factory-spec bikes to their teams. Maybe Honda could afford that. The way it is, is the way it’s always been, and always will be. I tend to agree. I don’t know that this is fixable. Either we make this a true prototype series, and Honda and Yamaha win every year, or we level the playing field and piss off Casey Stoner. The problem here isn’t the riders, it’s the fact that for the past half-decade there have been only four “alien” bikes. Drop Marquez onto Bradley Smith’s ride, and #93 suddenly ceases to be an alien. Make Dani and Aleix swap bikes, and watch what happens. Same thing, if Jorge and Pol trade garages. Now, granted, #46 is clearly an alien, but I seem to recall a couple of seasons not too long ago when he rode a particularly awful Ducati, and, ummm…. In fact, of the four current aliens, only Rossi has ever spent a moment of his MotoGP career on anything other than one of the four Repsol Honda or factory Yamaha rides. An additional fact: Over the past five seasons no other bike has won a single race, not even in the rain. Perhaps in Mike Hailwood’s day things were different, but in terms of the modern world of MotoGP, bottom line, Honda was absolutely right. It’s the bike, not the rider. At the very least, it’s mostly the bike, and very much less the rider. The rider determines which of the four factory Hondas or Yamahas will win a given race, but no other rider has a chance of winning, and the four factory Yamaha and Honda riders would have no chance of winning if they were riding something else. 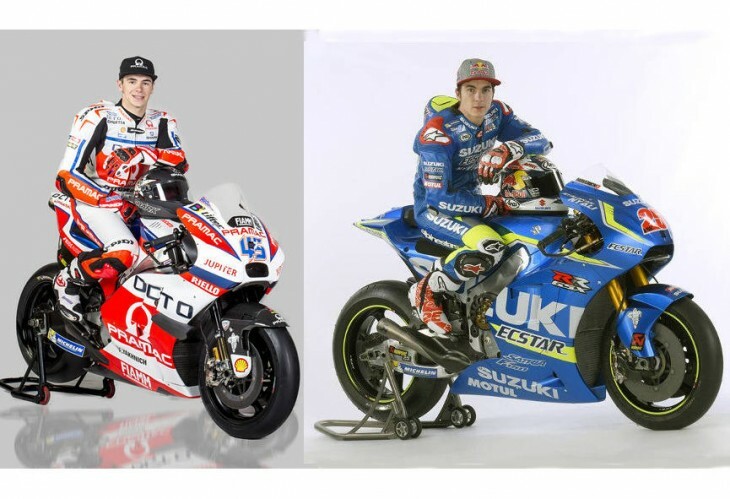 with exception of Stoner kicking everyone’s arse on a Ducati, what do you think the differences are between all of these bikes that makes this massive difference…. Stoner only kicked everyone’s arse on the Ducati during the one year when he had a clear advantage with the tires. Other than that one year, he was strictly win-it-or-bin-it, despite being one of the three or four fastest riders in history. He had to go back to Honda to win another title. As for what are the differences between the factory bikes and everything else? Power deliver, sheer power, (though not always), seamless transmissions, chassis precision, parts upgrades/availability, top-level test programs, and electronics R&D. R&D, period, really. Honda’s R&D budget likely eclipses all the non-factory Yamaha budgets combined. Stoner only kicked arse on the Ducati the one year when he held a dramatic advantage vs his rivals, in terms of the tires. Other than that one outlier season he was strictly win-it-or-bin-it on the Ducati, despite being one of the three or four fastest riders of all time. He had to go back to Honda to win another title. As for what are the differences between the factory Hondas and Yamahas, vs everything else? Power delivery, sheer power (though not always), chassis precision, seamless transmissions, much more sophisticated electronics, more comprehensive testing programs, superior parts, superior parts availability, and vastly greater R&D budgets. That’s the main thing, the R&D budgets. I would hazard a guess that Honda’s R&D budget eclipses everyone else’s combined, excluding the factory Yamaha team. I disagree, VLJ. If the four factory Aliens swapped rides with their satellite counterparts, you may see closer racing, and Pol, Smith, etc. may win a race or two here or there, but at the end of the season, the same four Aliens would be at the top of the standings. Scott, seriously, if Stefan Bradl and Marc Marquez swapped rides, do you seriously think #93 is already a two-time MotoGP champion at age twelve, or however old he is now? Come on, were you living in a cave during Valentino Rossi’s two years with Ducati? The guy is the GOAT. It’s not as if he suddenly forgot how to ride a motorcycle for two years, only to recover from his inexplicable amnesia the moment he hopped back onto the Movistar Yamaha. Moreover, Ben Spies actually won a MotoGP race on a factory bike. So did Nicky Hayden, and Marco Melandri. How did they fare with their other GP rides? This is what I’m getting at: Ben Spies won a (one) race. That year (2011) he had a total of 4 podiums. Lorenzo had 3 wins and 10 podiums. In 2012, Lorenzo won 6 races and NEVER finished lower than 2nd. Spies had ZERO podium finishes in his second factory season. Now I realize there were injuries and technical problems on occasion, but honestly, being on a full factory bike didn’t suddenly make Spies an Alien. (BTW, in his first year in MotoGP on a satellite bike, he had 2 podiums). When you look at the big picture you see similar trends with all those other guys who have had factory Honda and Yamaha rides. Moments of greatness, but just not quite at the same level as the Aliens. That’s why I said things would be closer, and yes, some non-Aliens could win races on factory bikes, but the Aliens are the Aliens for a reason. As for Rossi on the Ducati? That bike was absolute sh*t. No way around it. But we’re talking about Honda and Yamaha satellite bikes that are 95% as good as their big brothers. That Ducati was nowhere near as close, and if Rossi were on the new, much-improved and completely different Ducati they have now, he would win races. And lastly, I really don’t think Bradl is in the same league as Marquez. I just don’t. It’s difficult to say what they would do now, but the Espargaros and Bradls and Mavericks of the world did manage to compete with and beat the Marquezes of the world when the bikes were more evenly matched, in Moto2. I’m fairly certain that if Aleix had the #1 ride at Repsol and Marquez was relegated to a satellite (or worse) Something Else, Aleix would win MotoGP races and finish ahead of Marquez in the final points. For the life of me, I simply can’t imagine Jorge Lorenzo winning on a bike that was anything short of near-perfection. As it is, even on the dominant Movistar Yamaha, if that guy decides he’s having a bad hair day, his entire race is kaput. What would he do if his bike was NEVER COMPETITIVE? He’d fold up like like a cheap tent, that’s what he’d do. He’d whine like the bejeezuz to the media about it, too. Mark Marquez? On a crap bike? He’d crash his scooter on the way to the garage, just to avoid crashing again in the race. Dani? He’d look sweetly pensive, and remain utterly silent while collecting his fat eleventh-place checks from Mickey, Inc. I keep trying to respond to you and wjf, only to have my posts vanish into thin air. They aren’t “awaiting moderation,” either. They’re simply vanishing, the moment I hit submit. The brake rotors on the Suzuki look huge! Are those shrouds or the actual brake rotors? I always root for the underdog. Go Nicky. Go Mav. It helps to be put on a factory ride when you are 20 years old, though. A great rider on a satellite team bike will never achieve the same success as an equally skilled rider on a better machine. Of course, that will require more factory teams to step up their development to make the most of their rider’s potential. Plenty are born in, they just can’t all have an Orange Honda or Blue Yamaha. Iannone used to be one of the only riders who could win Moto2 races by long margins. Some of these others used to beat Marquez on Moto2 bikes, so we’ve seen it already. Even bikes would make this series look a whole lot different and we wouldn’t be calling a select 3-4 riders “aliens” anymore. The test results at Qatar are bearing this out. You might see Iannone up there too. I ride with a hunting hat…fur lined…and ski goggles with mirror lenses. I’ll be happy to try out the new electronic nannies. Woo hoo!! … and if MM is dishonorably discharged. Fine, I will get my leathers and join the Alien club… I’ll be the only guy racing in a Half helmet and aviator goggles! Agreed. I’d like to see some new faces on the podium. I hope the riders leave the 2015 embarrassment behind them, too. I hope the fans let them leave it behind. I hope Maverick is inducted.